In the wake of the shooting deaths of unarmed teenagers Jordan Davis and Trayvon Martin groups of protesters have been calling for change to the controversial stand your ground law. A stand-your-ground law is separate from traditional self-defense. The law gives individuals the right to use deadly force to defend themselves without any requirement retreat from a dangerous situation. Kenneth Adkins, Reverend of Greater Dimensions Christian Fellowship in Brunswick told Channel 4 that calling the law discriminatory against African Americans is false; Atkins said more often than not, the law actually helps African Americans. "The majority of the people who have benefited from the stand your ground laws have been African American." said Adkins. Adkins points to a Tampa Bay Times investigation done in 2012, that showed a significant number of African Americans in Florida used the stand your ground defense successfully. "Why don’t people who don’t like stand your ground? Talk to the people who have benefited from stand your ground," suggested Adkins. "If it had not been for Stand Your Ground 24 African American families in the state of Florida, their loved one would have been in jail," said Adkins. . . .
Another multiple victim public shooting, yet another attack that occurred where guns are banned. Tuesday’s tragic attack at a FedEx facility in Cobb County, Georgia, left six people injured, with one still in critical condition. The media quickly rushed in with stories about an “assault rifle” being used in the attack. This claim was made everywhere, in stories including the New York Times, USA Today, CBS News and the BBC. But it wasn’t an “assault” weapon. The attack occurred with a shotgun. Only the Atlanta Journal-Constitution mentioned it in a one-sentence update added to the end of an online story on Tuesday, the day of the attack. Even the Wall Street Journal bungled the coverage, concluding that the attack shows gun ownership doesn't help stop these attacks. 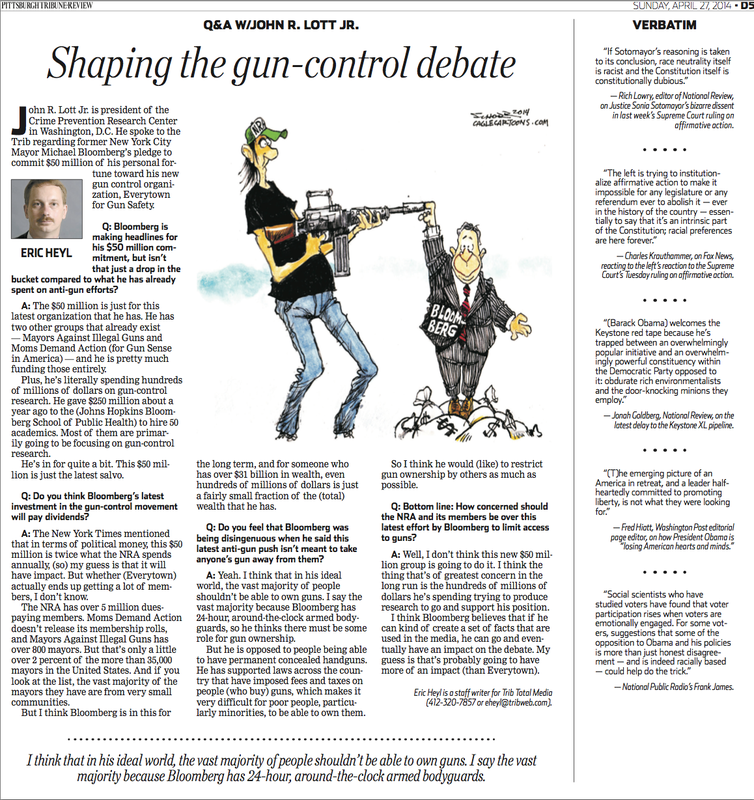 Tim Noah argued that the attack occurred in Kennesaw, a city that had “an ordinance requiring every household to own a gun,” but that all these guns didn’t stop the attack from occurring. . . .
How much do people like the state that they live in? How about how likely they are to want to move out of the state? New Gallup survey available here. Click on table to make it larger. People vote with their feet whether they want to stay in a state. Only 2 percent of Texans are extremely likely or very likely to want to leave the state. For other large population states, the same percentage is only 3 percent of Pennsylvanians want to leave their state. Does this bode well for someone such as Tom Cobertt who is running for re-election as governor in Pennsylvania? This would also imply that Illinois governor Pat Quinn is in trouble. There is a very nice review of the third edition of More Guns, Less Crime at Amazon. It would be nice if the review got some helpful clicks. 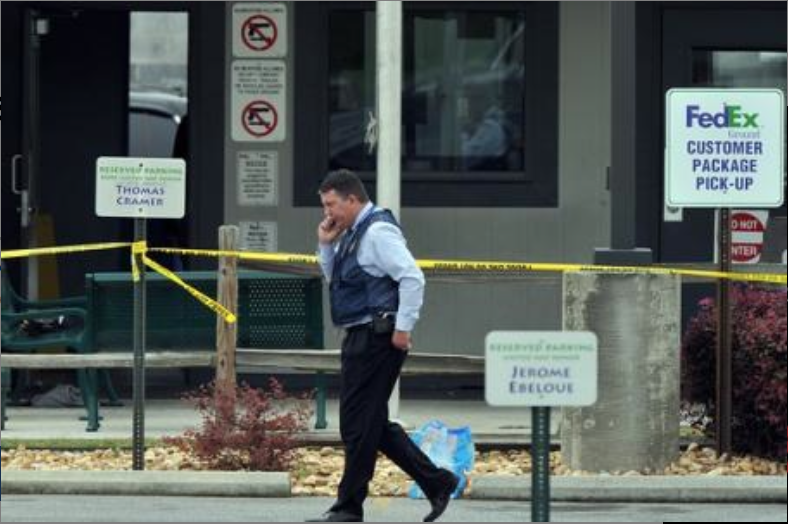 The result: potential waste of unknown value. . . .
Mass shooting yesterday at FedEx facility in Kennesaw Georgia to place in yet another "gun-free zone"
KENNESAW, Ga. – The father of a gunman who wounded six colleagues in an Atlanta-area rampage says his son didn't seem enthusiastic about his job but never mentioned problems with co-workers. In 1925, a minimum-wage law was passed in the Canadian province of British Columbia, with the intent and effect of pricing Japanese immigrants out of jobs in the lumbering industry. In South Africa during the era of apartheid, white labor unions urged that a minimum-wage law be applied to all races, to keep black workers from taking jobs away from white unionized workers by working for less than the union pay scale. . . .
Click on screen shot from the Pittsburgh Tribune-Review to make it larger. The original story is available here. Do you want evidence that if Eastern Ukraine had a free election it would vote against joining Russia? The views of this popular mayor in a city that the Russians will presumably soon control provides an insight into what people in this area of eastern Ukraine think of the Russians. This mayor was a strong supporter of the former Ukrainian President Victor Yanukovich, who was Russia's man in the Ukraine, but even though this mayor supported Yanukovich, he does not support Russian rule. Given that this mayor is extremely popular and is an elected politician, one would think that he has a reasonable good feeling for the views of people in this second-largest city in the Ukraine. Just something to remember when the Russian stage another election as they did in the Crimea. In a sign of the deepening destabilization of eastern Ukraine, the popular mayor of Kharkiv, the country’s second-largest city, was shot in the back on Monday, authorities said. Mayor Gennady Kernes was in critical condition after undergoing surgery at a local clinic, said Dr. Valery Boiko, who performed the two-hour operation. . . .
close friend of the mayor, former regional Gov. Mikhail Dobkin. . . .
Kernes and Dobkin were staunch supporters of former Ukrainian President Victor Yanukovich, who was ousted in February following deadly clashes between police and protesters angered by a decision to abandon an economic association pact with the European Union. Kernes, the longtime administrator of Kharkiv, was charged with making separatist statements and put under house arrest. In April, when pro-Russia protests spread across eastern Ukraine, Kernes, who was still officially under house arrest, persuaded the police to storm the regional administration building in Kharkiv and push out the separatists who were occupying it. The criminal case against him was then dropped and he returned to his mayoral duties. Taras Berezovets, a political consultant, said the attempt on the mayor’s life was a “gruesome message to other governors and administrators not to dare meddle in the Kremlin's game.” . . .
People in low tax burden states like their states much better. Gallup has an interesting survey asking residents of each state the "Best Possible state to live in" (column 2 on page 2). Residents of Texas, Alaska, Hawaii and Montana are much more likely to believe that their states are the best places to live, while Connecticut, Illinois, and Rhode Island don't have many of their residents who like the state. The differences are huge: 28% of Texans say that their state is the best to live in while only 3% of those living in Connecticut, Illinois, and Rhode Island say the same thing. 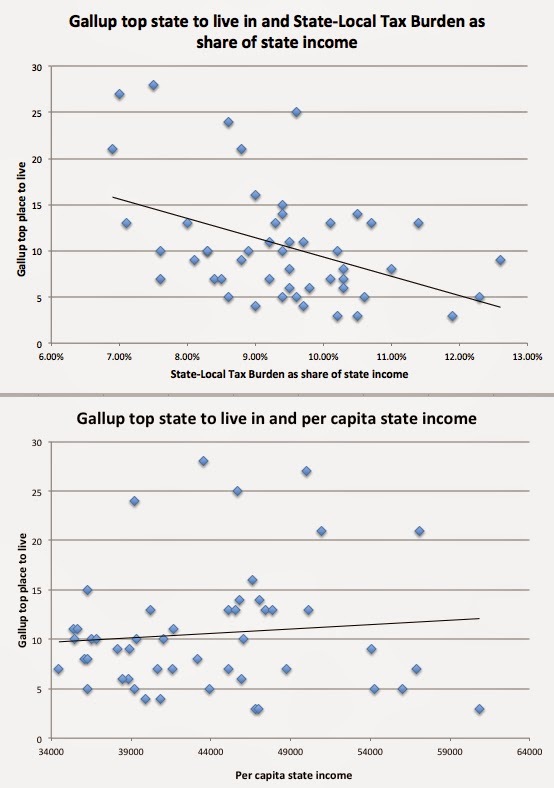 The following graphs show that states with low tax burdens and high incomes have the happiest people. I also tried average temperature and whether there is a large body of water (ocean, great lake), but those don't add too much explanatory power. More rainfall in a state seems related to lower levels of happiness. 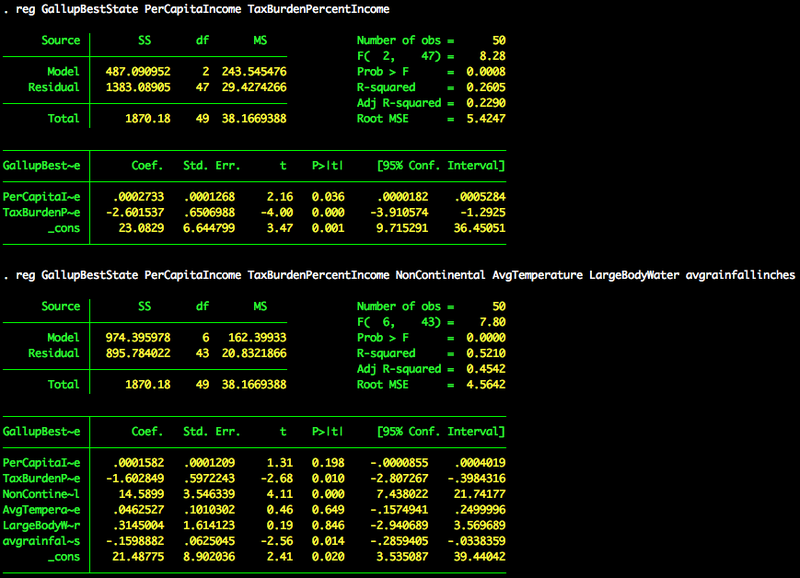 Even when you run regressions you get similar results. According to information BATFE provided to NRA, these actions are based on BATFE’s determination that the availability of a handgun in this caliber triggers so-called “armor piercing” ammunition provisions of federal law, which generally prohibit manufacture and importation. . . . The 5.45x39 is slightly narrower and a little longer than a .22 magnum. If you want to see the illogic of banning the importation of the 5.45x39 compare it to the .44 magnum or the 38 special. In inches 5.45 is about .21 inches, so that is less than half the diameter of the .44 inches magnum shell. The 38 special is .359 inches in diameter. The 39 millimeter length is 1.535 inches, while the .44 magnum is 1.61 inches (41 millimeters). The .38 special is also slightly longer than the 5.45x39 -- it is 1.55 inches long.